THIRTY FOUR: The nostalgic tune. – Folks, whack 'em. THIRTY FOUR: The nostalgic tune. This post is dedicated to my Mom. Without whom, this post wouldn’t have been possible due to my lack of knowledge of these beautiful, majestic tunes. I was doing a late night brainstorm session with a fellow Advertising student. During the session, we would play 70s and 80s music just so we can sing out loud and release our creative juice. He was really surprised of my vast knowledge of old songs and I explained, it’s because when I was a kid (around early 2000ish), my family would have annual road trip and my mom would play the mix tape* she had made specifically for the road trip. It was about 5 hour drive, so just imagine the same cassette tape for 5 hours straight. Playing over and over and over and over again. The songs got really ingrained on my brain. So this post is a reminiscence of my childhood and exploration of what if those songs are actually describing Volkswagen? 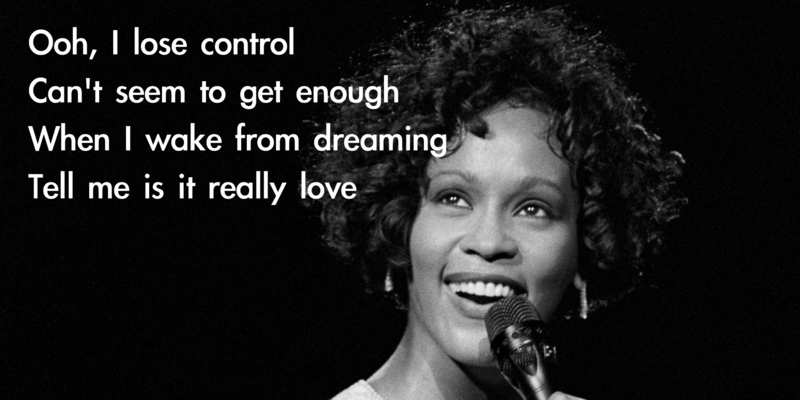 And Whitney Houston (RIP) just lost it. Whew, I think that’s it! This is a creative and engaging post. I like the pairing of the images with the text/lyrics. It would be interesting to see one (or more) finalized as a display ad incorporating a tagline about motoring pleasure/mix tape and the VW logo. The simplicity of these win! Great post. With all of the digital music shuffling and online personal radio options available, where do you think the mix tape concept lives today?